Have You Shopped With Us?Send Us Your Pictures! As I said before 2013 will not be only big for Harley Davidson or Indian Motorcycles, but for eBikerLeather as well. We are going to start selling t-shirts and we need your help! I know I am tired of looking at the same model pictures on our website, and I bet you are as well. Help us stand out from the leather apparel stores! We want! your high resolution pictures emailed to ebikerleather@gmail.com with our merchandise on you, and a sentence that states you allow us to use your picture on www.ebikerleather.com . I personally will send you a 10% OFF DISCOUNT code that will not expire for a two weeks! Wait I will make the deal better. I will give you 15% OFF DISCOUNT code that will NOT expire for one month! All you have to do is just send us your high resolution picture with a note stating that we are allowed to use your picture on the website, and in return I will send you 15% OFF coupon that will not expire for whole month! Our number one goal is to bring you the best news from all websites to one website. Each day we set out and hunt for the news that will interest you about motorcycles industry. Today we saw an article at Cyril Huze blog about custom engraving. At first glance the article did not catch my eyes, but what did were the engraved pictures. Born in Buenos Aires, Argentina, Herman D’Aloia moved to California when he was only 5 years old. D’Aloia started to practice metal engraving by hand. Herman started to pick up techniques, like hammer, chisel and air assisted to improve his engraving skills. It takes a lot of time, and its breathtaking to engrave in metal with your own hands. If you are looking for custom art of engraving in metal than Herman is your man to contact. Visit his website to find more engraving pictures, or styles that he has done in the past. Click here to visit Herman’s website. See See Motorcycles is preparing a cool event for bikers to show off their 21 helmets for 2013. What is so special about this event? It is that all 21 helmets are customized by 21 different artists. The past 21 Helmets event was amazing, and encouraged bikers to wear helmets. When you watch the video you will see a wooden helmet, which shows you that you can cross boundaries to create the best. Creating a helmet that is comfortable and appealing to bikers eyes is a challenge. But I am sure that 21 Helmets will have both style, and comfort at the event. No date has been announced for the 21 Helmets but I will keep updating when some information appears on their website. We are very excited to introduce our t-shirt designs. Designs have been made especially for our request, and we will share them as soon as they ship to our factory. If you have an idea for bikers design of a t-shirt send us your proposal and attach information so we can contact you. Our t-shirts should be here probably at the end of this week, or latest next week. As for now I don’t have any details to show but I know that you will be not disappointed. What can you expect from our T-Shirts? First of all market for t-shirts is wide open, and that means that a lot of people are selling biker T-Shirts. But our advantage over our competition will be pricing, at places you might find a T-Shirt for 20$, and at our online store you will be able to find a T-Shirt for 10$ or 15$. We surely will lower our pricing on T-Shirts to get our competition to the boiling point. We are bringing in 4 of women styles, and 5 of men styles T-shirts. The first couple day’s our selection of T-shirts will be on sale, and I am sure that this will be buy 2 T-Shirts and receive a flat rate shipping of 7.99$. Spread the word out! Have an idea for biker t-shirt design? Send us an email to ebikerleather@gmail.com. Choice Is Coming To American Motorcycles? Since the whole turnaround of Indian Motorcycles is coming stronger and better, we start seeing things like Thunder Stroke 111 Engine, and much more. But let’s skip away from that since most of us saw this at Daytona Bike Week. Now I want your attention more towards Indian Motorcycles slogan that is being used with the campaign. The slogan is “Choice is Coming to American Motorcycles.” What does this mean? It is hard to predict the outcome of the message, but it has something to do with the new Thunder Stroke engine. We know that the engine will be available for the 2014 of Indian Motorcycles lineup, that is only 7 months away from the new engine. Or I might be wrong, and Indian has prepared something totally different, and unexpected by fans. However, I am sure that there is something behind that slogan, which we don’t know. If you are not a member of BikerPics.org I strongly suggest registering your membership today! Today I woke up came to work and saw an email from BikerPics.org to check out their 3rd E-Magazine issue on Daytona Bike Week 2013. The 3rd issue is packed with tons of cool pictures for example, wet t-shirt contest, motorcycles, fun at Main Street etc. If you missed Daytona you can always catch up with BikerPics.org. Whoa, what a huge change from Audi. Since Audi got hold of Ducati business last year, BMW is not the only German automaker that also has motorcycles. 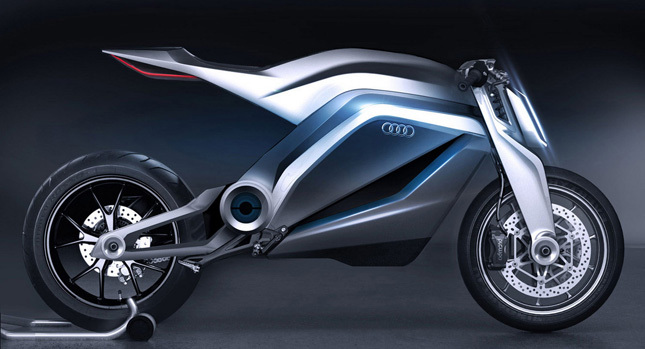 French designer, Thibault Devauze imagined the first Audi motorcycle. Devauze is a former Audi, Ducati, and Land Rover design intern and penned a futuristic bike with sharp edges. Thibault came up with this idea from the DKW bikes which he saw at Audi museum in Ingolstadt. So with that said, do you think that Audi will start making motorcycles? I would say since the top competitor for Audi is BMW it would be nice to see Audi step up and get some space in the motorcycle market. Whether Audi would make some damage to BMW market or not it is still far away to tell the prediction. The Enorm V3 Bullet eBike Looks More Like A Motorcycle? Since some time now companies have been completing in who has the ability to bring green into their rides. Mostly those are new start-up companies that feel if they can produce an eco bike that it will grab attention from Harley or Indian. However, this will not happen for the next 10 years probably. We have seen plenty of e motorcycles in the makes from different companies. However, we did not see Harley, Indian, or Victory motorcycles hit the green transportation trend. Even though the green bikes are able to do 62 miles on 1 charge, it won’t be for long time till they get popular. If the companies hit that stage where on a single ride you will be able to enjoy the journey, speed, sound, vibration etc than the e motorcycles will be a success. For riders that ride Harley, Indian, or Victory motorcycles it will be a hard switch to the e motorcycles. The V3 Bullet stylish design allows it to have huge 24 inch in the back wheel, and 26 inch in the front wheel, giving the motorcycle bold look. The rumors have been that the Enorm V3 is going to come with a Smartphone, but so far there is no insights if it will be a Smartphone like iPhone, Galaxy or their own branded phone. The top speed has not been revealed for V3 Bullet yet. The asking price for Enorm V2 is around $5,200 but you can bet that the V3 won’t be cheap for an e motorcycle.